Buy 3 or more of this item for a 5% volume discount! Buy 5 and get one free! Buy 3 or more get 5% off; or buy 5 of this product and get one btl FREE (no volume discounts with latter)! 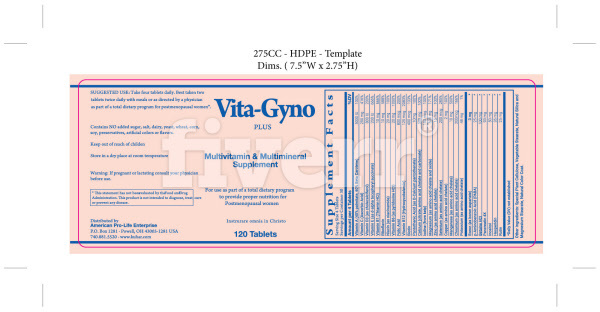 Vita Gyno (TM) Formula does not contain: IRON, sugar, gluten, soy, corn, milk, egg, starch, artificial flavoring or preservatives, per the manufacturer. Does contain a minute amount of coloring which has neglibile artificial dyes. Suggested use: 2 tablets twice daily (up to 4 tablets per day) with meals or as directed by a physician as part of a total dietary program for perimenopausal and menopausal women. Menopause Formula is best taken daily throughout the month. ​ProCycle Gold contains NO added sugar, salt, dairy, wheat, yeast, corn, soy, preservatives, artificial colors or flavors. Flax Seed Oil 1000mg Capsules 180 + 20 FREE!